Definition at line 38 of file Query.h. Definition at line 39 of file Query.h. Definition at line 22 of file Query.cpp. false if an error occurs, otherwise return true. Implemented in clang::query::SetNonExclusiveOutputQuery, clang::query::SetExclusiveOutputQuery, clang::query::SetQuery< T >, clang::query::LetQuery, clang::query::MatchQuery, clang::query::QuitQuery, clang::query::HelpQuery, clang::query::NoOpQuery, and clang::query::InvalidQuery. 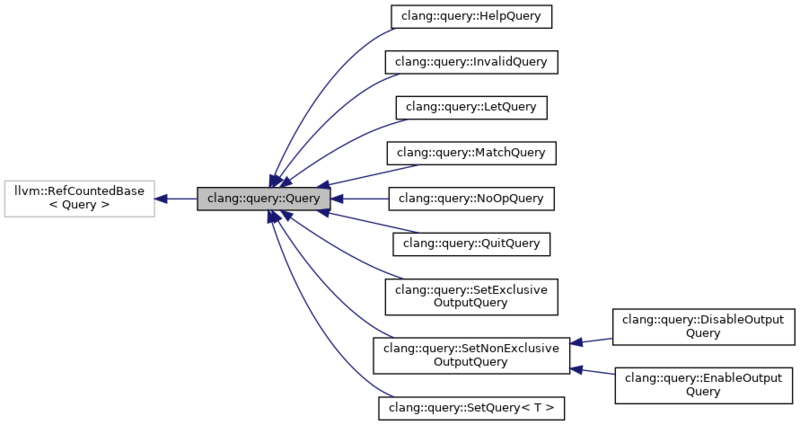 Referenced by clang::query::HelpQuery::HelpQuery(), clang::query::InvalidQuery::InvalidQuery(), clang::query::LetQuery::LetQuery(), clang::query::MatchQuery::MatchQuery(), clang::query::NoOpQuery::NoOpQuery(), Query(), and clang::query::QuitQuery::QuitQuery(). Definition at line 47 of file Query.h. Referenced by clang::query::InvalidQuery::classof(), clang::query::NoOpQuery::classof(), clang::query::HelpQuery::classof(), clang::query::QuitQuery::classof(), clang::query::MatchQuery::classof(), clang::query::LetQuery::classof(), clang::query::SetQuery< T >::classof(), clang::query::SetExclusiveOutputQuery::classof(), clang::query::EnableOutputQuery::classof(), and clang::query::DisableOutputQuery::classof().